Alantron Review 2019: Is Alantron a Good Hosting? Alantron is a Turkey-based provider of web hosting services that includes shared hosting, VPS, and dedicated servers. The company was founded in 2008. Their shared hosting services offer fantastic features and an incredible 99.9949% average uptime. If you’re looking for a host with unlimited storage and bandwidth for either Linux or Windows shared hosting, this company should be on your shortlist. These are some fantastic features that give you a ton of control over your hosting and your website. I would’ve liked for Python, Ruby, and other advanced developer tools to be supported, but only the most advanced websites will have an issue with this host. I am a bit disappointed they don’t offer free domains or SSL certificates, but with the features they do offer, I’ll let that slide. Beginners will love this provider as they offer a website builder with over 500 templates. They don’t list an auto-installer for programs such as WordPress, so you may have to go the manual route. Contact customer support to see if they will offer assistance for installing WordPress or other CMSes. Otherwise, you can use the included cPanel or Plesk control panel to build your website. These packages offer great value and pricing that’s on par with other providers. On top of that, if you opt for a year of hosting, you’ll pay the equivalent of ten months’ hosting. Opt for a two or three-year plan and you’ll save even more. Again, note that your domain and SSL certificates are not free, so factor that into your costs. These plans come with an unconditional money back guarantee for the first 180 days. However, if you request a refund after six months, you will only receive credit back to your Alantron account, which can be applied to any Alantron service. Alantron offers robust technical support consisting of live chat, telephone, ticket, and email support. They also have an extensive knowledge base available. You must be a customer to access their support phone line. It’s rare to come across a provider with the features offered by Alantron. While not perfect, they’re one of the better providers I’ve come across to date and definitely one you should look into. Even though you have to pay for your domain and SSL certificates, this service is still a better value than most providers. 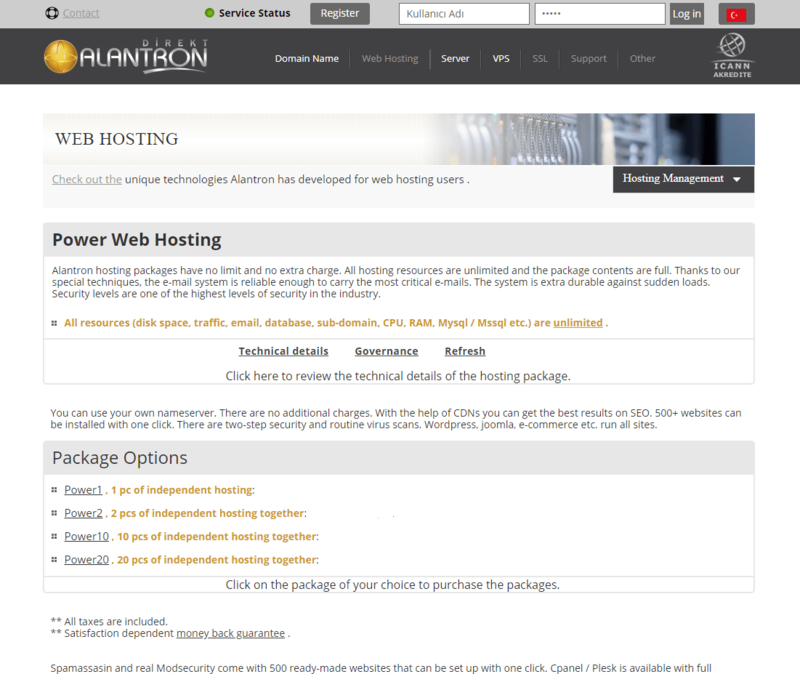 Wondering how Alantron stacks up against other Web Hosting companies? Enter any other Web Hosting company and we will give you a side-by-side comparison.